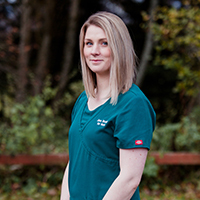 Jane qualified in Vet nursing in 2014 at North Highland College in Thurso. She then worked in a mixed practice for four years during training before joining Inshes Vets. Jane is now training for her Certificate in Hydrotherapy. Roger is her faithful working cocker and Jane enjoys training and working him as one of her hobbies.